The Labor Leading on Climate Initiative advances knowledge, policies, and practices to enhance the role of labor and working people in addressing the environmental and climate crises. The initiative’s efforts focus on building a truly sustainable society and economy. Since 2009, Oklahoma has cut more of its state education funding than any other state in the country, cutting more than $192m since 2009 according to a report released by the Oklahoma Policy Institute. The cuts came after the state lost more than a quarter of its operating budget because of a series of cuts to the state’s oil and natural gas production tax and personal income taxes initiated in the mid-2000s. While neighboring Texas has an effective taxation rate of 8% on oil and natural gas, Oklahoma’s tax rate sits at a mere 3.2%. If it were not for the tax cuts on natural gas and oil as well as personal income taxes, the Oklahoma Policy Institute estimates that the state would have an additional $356m to spend on K-12 (primary and high school) education as well as an additional $238m to spend on higher education. French rail unions have launched three months of strike action in a showdown with Emmanuel Macron, but their capacity to sustain it will depend as much on the durability of their and their workers’ finances as on amassing political capital. Register Your Event – ED2MD 2018! Since Earth Day to May Day 2017 we have seen disastrous repeals of protections for the planet in this country and continued climate consequences detrimental to the entire global community, but we have also seen powerful strike actions connecting our struggles and showing us what organized grassroots democracy powered by the people can do. Climate Democracy in Action! 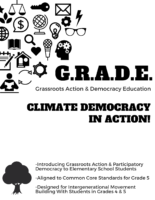 is a set of activities built to be used in conjunction with each other for several hours worth of climate democracy movement building with students in grades 4 – 5, meant to help inspire interest and facilitate learning around grassroots democratic action and how kids can be active leaders and participants in the fight against climate chaos. Motivated teachers can use these activities as a framework for allowing students to choose an action that could be carried out for Earth Day.